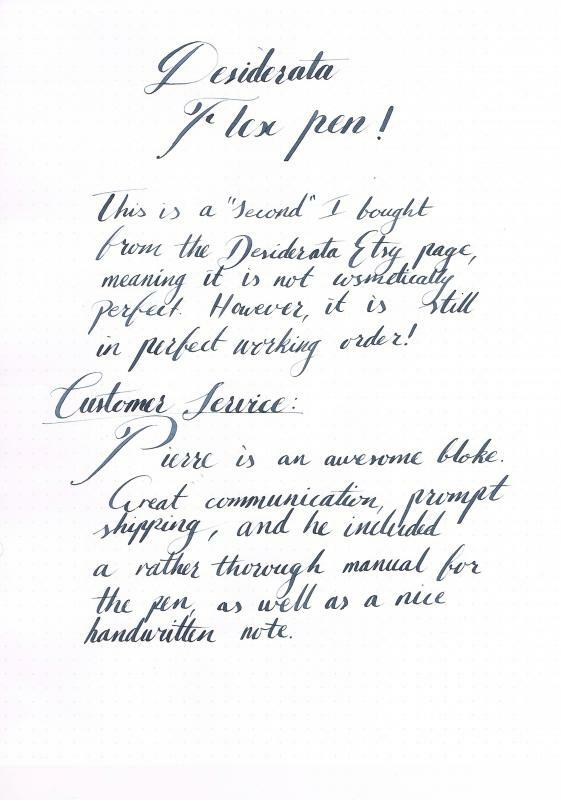 I bought one of the Desiderata Flex Pens from their Etsy store a few weeks ago. 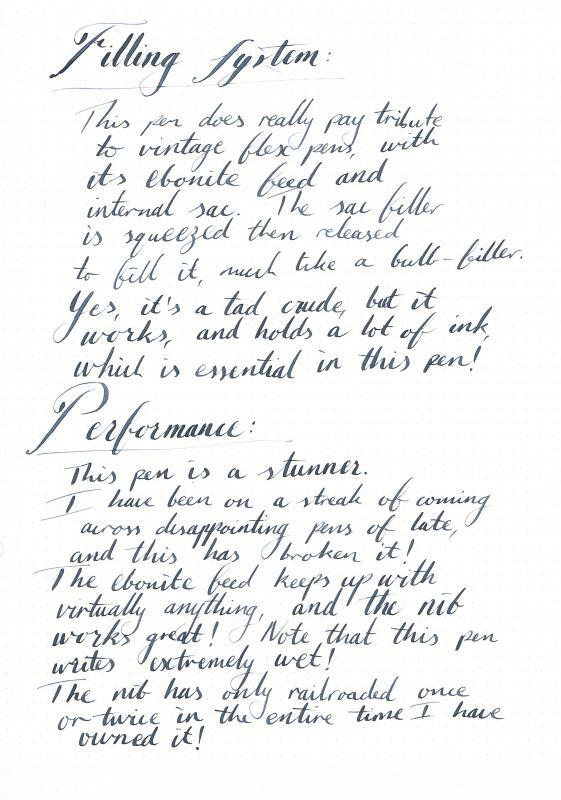 As a calligrapher myself, I was interested to see how a Zebra G nib (one of my favourites for Copperplate writing) would go in a fountain pen. I wasn't disappointed. 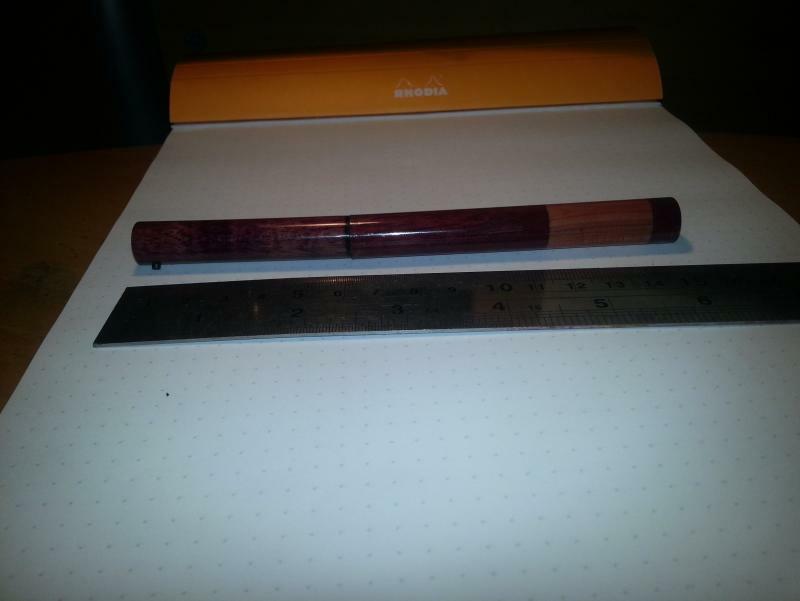 The review was done using Pilot Iroshizuku Fuyu-Syogun on Rhodia dotpad. I put pressure on the nib throughout the review just to see if the feed would keep up, hence why my writing looks a tad strange. This is the filling system; a sac siliconed on to the section. My only quibble is that the ink tends to form globs at the end due to surface tension, and you have to mess around with it to get it to flow down to the section. Here you can see why it's a "second". The cap doesn't quite fit. But seeing that it's completely functional, I don't mind in the least. The only problem I have with the pen is that the design of the section means that my middle finger tends to slip off it and onto the feed, where it becomes covered in ink, often without me noticing. 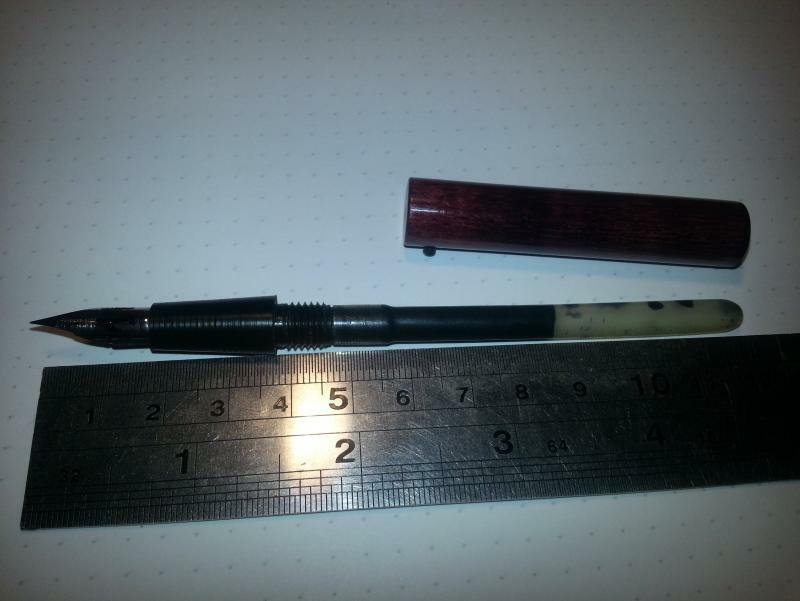 I love this pen, to the point where I even took it to uni and took down notes with it! 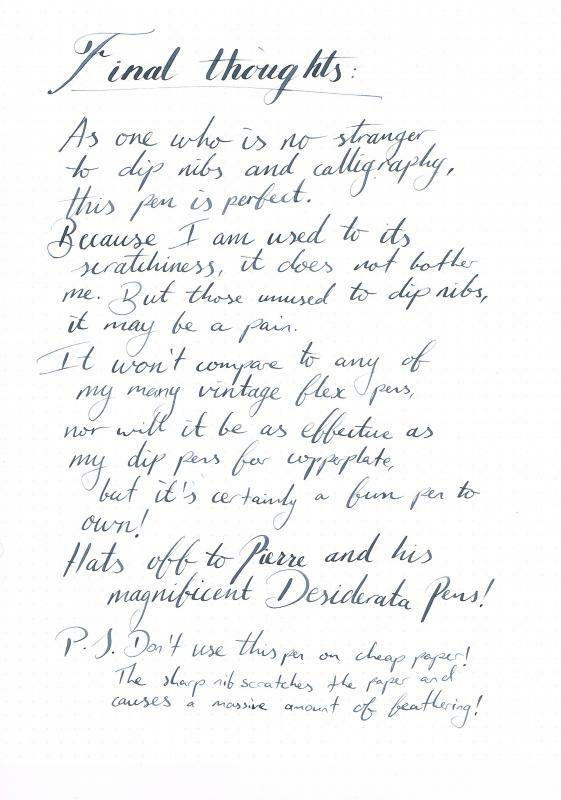 Congratulations Pierre of Desiderata on designing a fun calligraphy pen that WORKS, without the hassle of other modern flex brands. Edited by Ego Id Veto, 28 August 2014 - 15:16. Sheaffer Triumph, Saratoga, Targa Slim and Targa Standard; Waterman 3V and 52 1/2V; Mabie Todd Swan Self Filler x 2; Eagle Unbreakable in sterling silver; Eversharp Bantam; Parker Duofold Lucky Curve BCHR and Duofold in red hard rubber; Spors Co. glass nib pens x 4; Conklin 2NL and 20P. 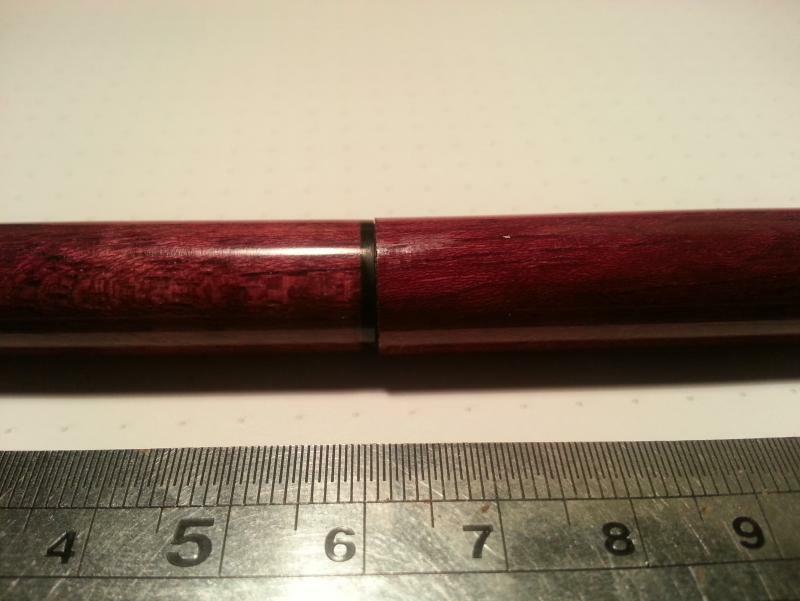 Very interesting pen. Where can I get one? I believe it's kind of a prototype, and Desiderata is working on producing more soon. So far as I know, you can't get them anywhere just yet. You are close, yours is a first generation production version. Mine is a prototype. 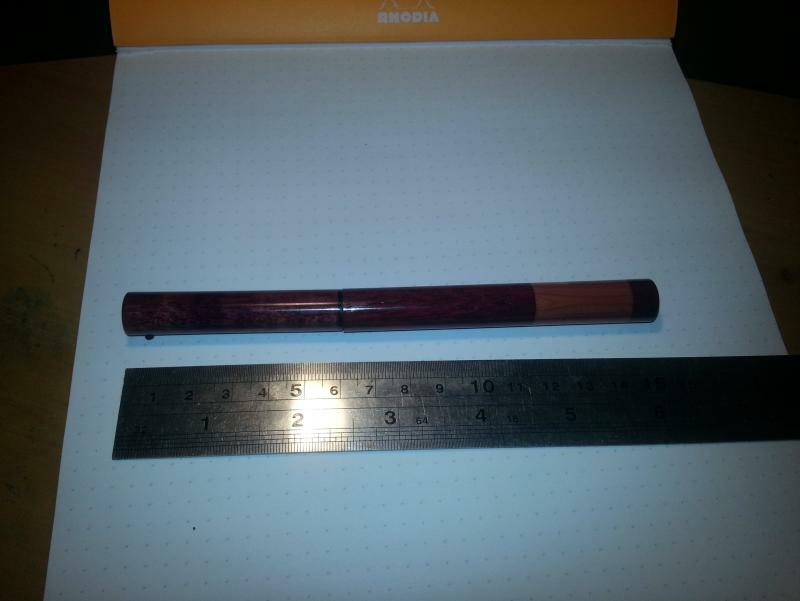 You have purple heart/cedar, I believe mine to be Delrin. I think Pierre is working to increase production but, as the feed and final assembly is by hand, it may not be as fast as we would like. I will say I really, really like mine. 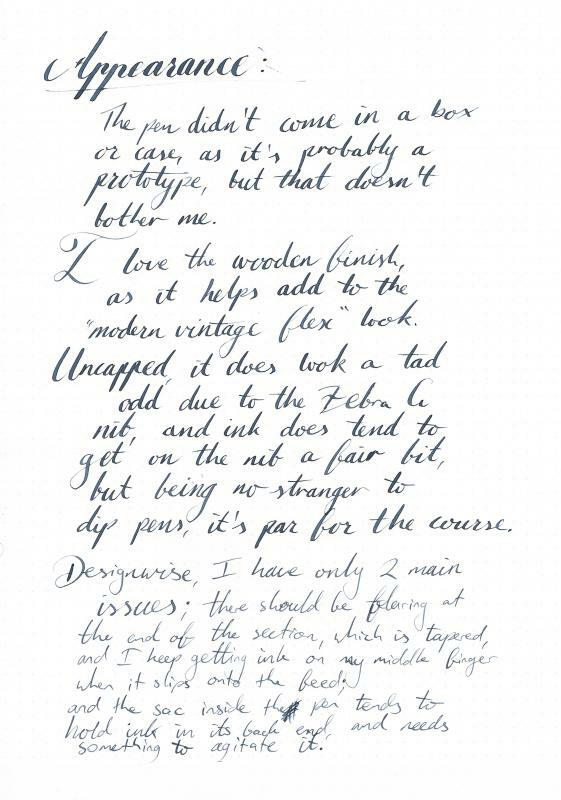 If you notice me commenting every time these pens get mentioned it's because I tried to convert pens to use dip nibs. I could never get the feed right. So I guess a little jealousy, but a lot of respect for accomplishing what I could not. As long as his pen works as it does. I will sing his is praises, but if he tries to take shortcuts I will make it know. Very cool. Thanks for the look. I will follow this thread, keep us up to date if and when these pens go mainstream. Thank you for the thorough review. I'm glad you're pleased. I'm working on different designs for the section, and my machinery has been worked out so caps will match barrels again. Perhaps in your next design you could include something to break the surface tension of the ink. It tends to get stuck in a blob at the end of the sac, and it is tough to get it to run back down into the section without tapping it and making a mess. 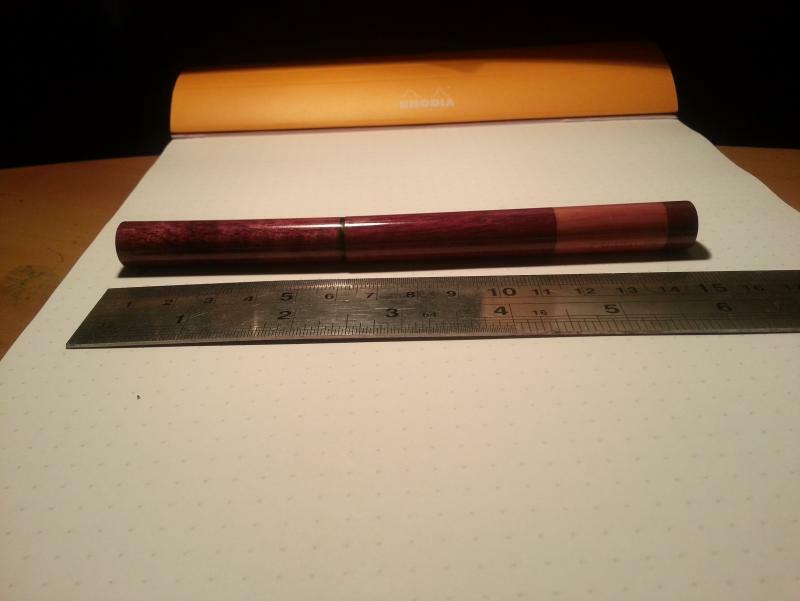 This is a beautiful pen. I need one, need one, need one. I cannot enter their site. Could you tell me where could I get one, please? they ask for a password!!!!!!! Edited by fountainpagan, 11 September 2014 - 08:10. Go to their Facebook page, they don't have a website yet. I have achieve to contact Presto Tenebroso on Etsy. I can hardly wait for thr pens to be available. Certainly looking forward to these and their availability. well done. Well done. Maybe he can repurpose and add in agitator beads in there meant for nail polishes like these. I'm sure they're available on Etsy, Amazon, Ebay, etc. too in different sizes. Edited by legume, 15 September 2014 - 02:09. FountainPagan in his excitement figured out the website address below! I talk about that lower in this response. Try washing the inside of the sac. Wow. You're persistent! The PW is there because I'm still working on it! Soon to be at the beginning of next month. Check out that website FountainPagan deduced during the beginning of next month. Agitator beads are an interesting idea, but once you get your hands on one, you might see that it's a little overkill. If ink beading is that much of a problem, you could try getting a cotton swab and washing the inside with soap and water then rinsing. Most likely the beading is because the ink doesn't want to be in contact with the inside of the sac. Anything you can do to make them get along might even out your flow. very nice review. 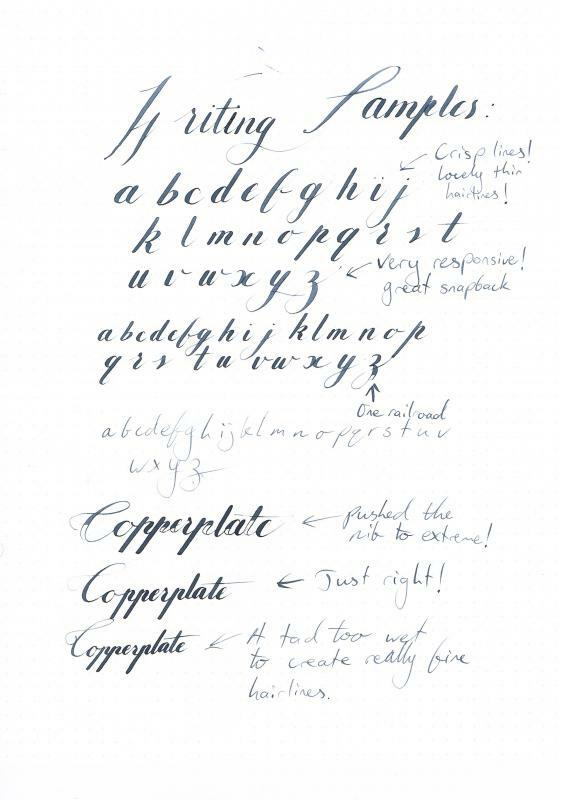 and nice handwriting too. 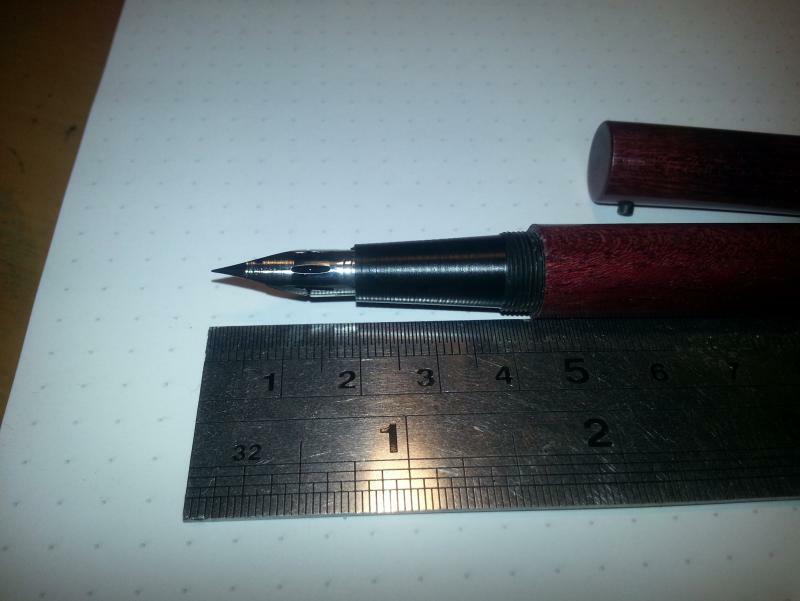 Inexpensive, high performance, "modern vintage" flex fountain pens. Designed, engineered and handmade with American labor in the USA. Sales have begun! It is a Zebra G in there. Yes the white balance is screwy. No gold plating here! Just the normal ZebraG. They are chromed and last longer than raw steel dip nibs. If you keep them clean and dry they hold up quite well. Buying a few spares isn't a bad idea as they do wear and at some point rust is inevitable. 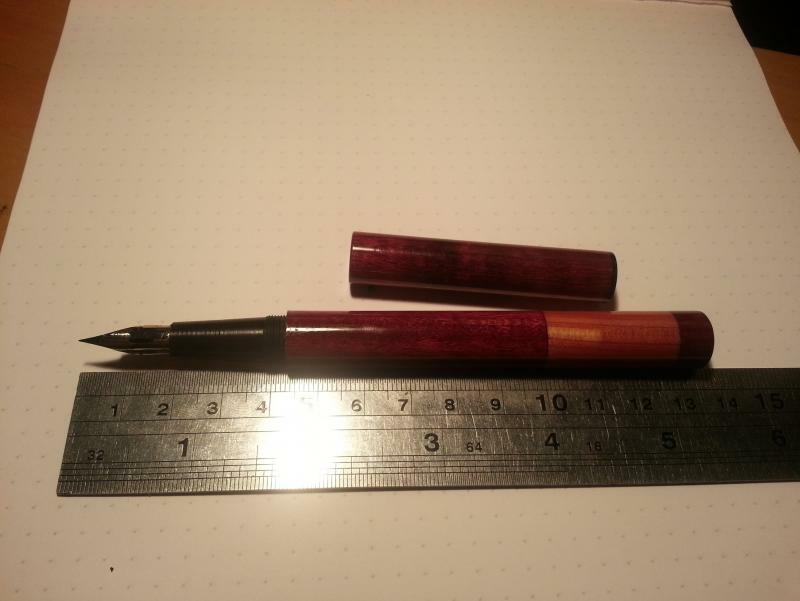 I am still jealous of Presto getting his pens to feed, I still try to convert some of mine. When I get sick of fiddling and want to write I ink up my Daedalus. Thanks again Pierre.